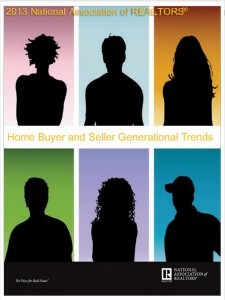 The National Association of REALTORS released the first ever Home Buyer and Seller Generational Trends report last week. The 104-page document compares the habits, practices, beliefs and goals of the Silent Generation, people born between 1925 and 1945, and all subsequent generations through the Millennials, who were born between 1980 and 2000. A new report from the National Association of Realtors report outlines the differences among younger and older home buyers and sellers. Based on some of the data regarding the younger generations, Help-U-Sell Real Estate is perfectly poised to assist them in their real estate transactions. Younger buyers are more likely to want help understanding the process because they’re most often inexperienced in purchasing a home. Help-U-Sell offices often have agents dedicated to working with buyers, and our specialized Jack Bailey Buyer Consultant Training program is nearing completion. The majority of Millennials who sold their homes used a full-service brokerage, but they were more likely than other generations to opt for limited service, presumably due to less equity in their properties. With a business model that offers full service (or less, if desired) for a low fee, Help-U-Sell is a perfect fit for the newest generation of homeowners. Why are the younger buyers and sellers a desirable demographic? According to the report’s findings, they are the most optimistic, and younger sellers are the most likely to use the same broker or agent for their next purchase. What can you do to attract Millennials? * Make sure you’re easy to find online. * Consider creating a Facebook ad that targets that age group who live in your area. You can further home in on potential buyers and sellers by selecting people who are newlyweds or just had a child, factors that could precipitate a move. * Avoid the hard sell. Instead, offer information in a conversational tone. * For buyers, write a blog series or create a drip email campaign geared toward educating first-time buyers. * For sellers, let them know about your low set fee and how they can save the most money. These tips can include staging on a budget and how to market their property to friends, co-workers and neighbors, along with the different ways your office works with sellers. What tips do you have for working with younger buyers and sellers? 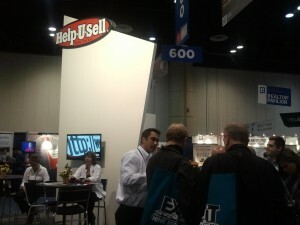 We’re just back from the 2012 Help-U-Sell Success Summit, and the REALTORS Conference & Expo leading up to it. By all accounts, both were a great success! 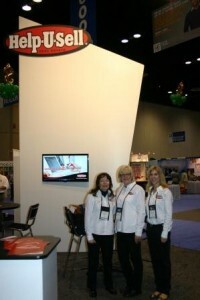 We loved seeing our brokers from all over the country. Several of them (Kim and Mike Zelena, Leigh Anne Losh, Kyna Baehr, and Walt Hippauf) drove hundreds of miles to be with us in Orlando. Thank you to everyone who spent time at our expo booth. Your testimonials to prospective franchisees are more powerful than just about anything we can say to them or show them. A special thank-you to Dan Desmond, who made the trek from storm-damaged New Jersey to help out at the Expo and to attend the Summit. 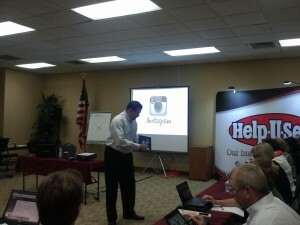 We hope all who attended the Success Summit got some great takeaways. The hands-on approach and interactive discussions about OMS and website requests and your fee structures taught us, too. We also talked about partnering with a wonderful charity that gives food to the hungry and about adding a potential vendor to our program. As we get closer to finalizing those partnerships, we will keep you informed. Those of you who couldn’t make it this year, please mark your calendars and start saving now for the 2013 events in San Francisco. The NAR dates are Nov. 8-11, and we will have our Success Summit immediately following. We’ll provide more information in the months to come. Meanwhile, enjoy a few photos from the Expo and the Success Summit. 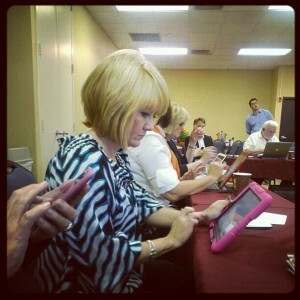 Tracy Jacobs of Help-U-Sell Quad Cities Realty takes notes during the Success Summit. We’re finalizing plans for next month’s Success Summit, which will take place Nov. 12-13 in Orlando. This year, the focus will be on Help-U-Sell® Core Marketing and will feature special guest Pete Codella, who will teach us how to build and maintain a profitable online presence. We’ll also unveil new technology and have fun mingling with and learning from each other. Some of our top producers will be sharing their secrets to success, as well. Read more about the Success Summit and register at http://seminars.helpusell.com. 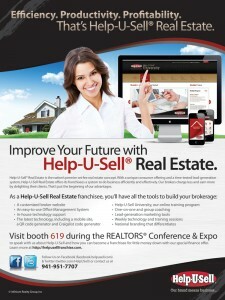 If you can, come early for REALTORS Conference & Expo. We’ll be in the expo hall again this year. 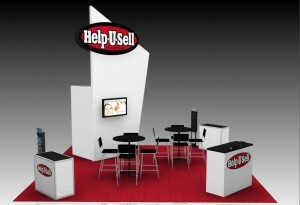 Check out this rendering of our booth! It’s similar to last year’s but with a more contemporary light gray color and red carpet to match the new marketing materials. We would love for you to help out at the booth (#619) or just stop by to say “hi.” Expo-only passes for NAR members are just $25, and the Clarion Inn & Suites will honor our $92/night room rate before and after the Summit. Our block of rooms is almost sold out, so call the hotel (800-826-4847) and make your reservations as soon as possible. Author adminPosted on October 16, 2012 October 18, 2012 Categories Help-U-Sell Updates, National Association of RealtorsTags Help-U-Sell, marketing, Success Summit, technology1 Comment on See You in November!